It was cold. The air was vibrating with his presence in the dark void, which could be hearkened to a searing electric pulse across your skin. It beat in time with the dragons' own slow heartbeat as he peered through the shimmering portal. The ancient creature slowly shook his head, incredulity and a deep sadness gripping his features. The madness of humans was overwhelming. The draconic spectre waved a claw, banishing the view of the outside world and closed the portal. He had never seen anything like it. He, who had survived through the countless ages, before humans, before life had even begun on this solitary little planet....All the global disasters, all the death, all the brutality of a living, breathing earth....and nothing could compare to what was happening now, on that tiny little island of what the humans called Japan. He listlessly snaked through the tingling and bristling air, the dark clouds of negative matter angrily growling at him as he passed through. There have been many times he had intervened in human affairs, and every one of them ended up with him being feared and hunted. Humans were unlike any other animal- their fear turned to absolute hatred. Hatred so thick and pure, it was like a toxin that enveloped the whole planet and choked it. He had often thought of ridding the planet of their blight, if only to give the other living beings on it a fighting chance to survive. But genocide at the time didn't seem to be a fitting response to the humans' callousness, and so he remained in his kingdom of distortion and antimatter, alone. His crimson eyes glowed eerily in the darkness as he scanned ahead of him, searching. Negative energy exploded around him, releasing shock waves and black bolts as he disrupted the hostile atmosphere. His dark, shimmering scales glowed with each blast as they absorbed it all, hissing and popping as they discharged the excess energy. Faster now he cut through the deep thick clouds, a dark scowl etched on his maw. Now is the time for their judgment day. A thundercloud the size of a small city rumbled over the ruined lands of Unova. Deep within the center of it, Zekrom awakened from yet another restless night, plagued by dreams of claws and teeth, fire and death. The great dragon opened his crimson eyes, stretching his body as it floated amidst frantic flickers of blue lightning, angry clouds the color of his own scales and flurries of heavy rain pelting at his face. He wished he could awaken one morning and find that all this had been a horrible nightmare - that his region was still safe and prosperous; its people alive and safe... and Blair still out there, somewhere, waiting for the day when he and his dragon would be reunited. But he couldn't find him. Ever since waking up, Zekrom had searched every city in the region; scoured every route; poked his head into every building. He'd even returned to Dragonspiral Tower to see if his Hero was waiting there for him, but he wasn't. In fact, he hadn't seen any living humans whatsoever. Zekrom clenched his fists, growling as a spark of lightning zigzagged across his scales. If he'd woken up just a little sooner, he could have found Blair and together they would have stopped this plague and saved everyone. They could have stopped this. But he was alone. Without Blair he felt as helpless as an abandoned baby Kangaskhan. But recent developments had piqued his interest; if he was reading the signs correctly, the answers to his questions were likely to be found in another region altogether: Johto. He didn't want to believe that the humans were responsible for something as terrible as this, nor did he want to place the blame on his fellow Pokemon. But if anywhere had answers for him, it was Johto, the region where it all started. He faced a huge journey across the sea, but if it would put his mind at rest, it would be worth it. The storm clouds around him began to dissipate, revealing the silhouette of the great dragon within. Zekrom turned his gaze southwards towards the ocean, a glistening line on the horizon. He stretched out his wings to their full capacity, taking one last forlorn look behind him at his region. Blair... I'll be back, I promise. I won't stop looking for you. Until then... please wait for me. Once I have answers, we'll know just what to do to save our region, and the rest of the world with it. Farewell, my friend... be safe. His huge, cone-shaped tail began to whir and whine, glowing cyan blue as crackles of electrical energy flickered around it. In an explosion of bright light, Zekrom shot off like a comet, towards the ocean; towards Johto; towards the path to his ideal world. The entire region of Johto has fell to a state of disaster. The dead walking the earth, devouring anyone that they sink their teeth into. Lugia couldn't believe what was going on. They wasn't shadow pokemon and certainly anything that of territorial. Rain started to fall from the clouds as the light of day began to appear. A world that no longer was safe anymore. Lightning flashed as the sign of another legendary has ascended to the call. "What is going on?! The dead risen from the graves. Could Cipher be involved in this? That lightning though. Could it be him?" Questioning himself on the sight of the lightning strikes, it looked like it could mean that a fight for life has just begun. Goldenrod was invaded with undead pokemon and other cities was in terrible shape as well. Humans running from the undead, screaming and panicking as the dead eat the flesh off their loved ones and pokemon they called friends. It was a hell on earth and nobody was safe. Would his fellow legendaries survive this or would they fall prey to the beastly creatures that had been once his fellow pokemon? It mattered not anymore and if any of the legendaries survived it would be time to meet up with them. A call with his powers would do to any of his brothers and sisters that are still alive out there. It was an emergency. The time had come to address the issue at hand. A place to meet would be of great importance. "If any of my brothers and sisters still live. I wish to meet you all at Ilex forest. We must come together and find out what is happening to our world." Afterwards, Lugia set off to Ilex forest to meet with his brothers and sisters. Smoke and fire had continued to burn in towns and cities where the undead have ravaged. Down below, the sounds of the dead can be heard as clear as day as sounds of flames did little to mute out the moans and wales. Ilex forest was up ahead and the forest had grown eerily quiet over the course of days that passed. Ariados webs had covered the once luscious trees that grown there. An explosion of thunder was heard as the storm had drawn closer. The rain would help them from being exposed to the walking dead. Seeing an opening, Lugia had landed, surveying the area for any undead that could be lurking nearby. None was present at the moment. This was a good place to wait for the others to arrive. The timing of the others would depend on how far they was. Lugia had thought of what happened in Orre that day then he questioned if Michael was still alive or if he vanished from the face of the earth. Either way it was something to be concerned of later. For now the legendary would wait. "If any of my brothers and sisters still live. I wish to meet you all at Ilex forest. We must come together and find out what is happening to our world." Giratinas whipped around as the avians' voice echoed in his mind, his gaze searching and momentarily wild. The dragon quickly summoned a vision with a slash of his claw, the clouds in front of him shimmering and revealing a pale creature in the depth of Johto. It's long scaled neck and large feathered arms emerged from the surf of a gulf, its' wings beating against the wind as it took to the skies. This was something unprecedented! Nobody ever contacted him through the wastes of his land. Many didn't even know of his existence, they were so young...and he so old. Yet Lugia, one of the guardians of Johto, had. What possessed this one to reach out through the depths and cry out for help? This young one, who somehow was able to reach him and perhaps beyond, with his cries. Did he not realize the mortal danger he put himself in? The dragon narrowed his eyes, conflict arising in him as a deep hiss escaped his throat. What does he do with this one, and the others he may attract? He knew more than most what the elder legendaries did to those who even poked their heads out, let alone strayed out of line. Clenching his teeth, he made up his mind. Lashing forward, he dove through the thick clouds, ripping open a portal in the skies emerging with a sinister crackle before the shores of the Ilex. The sky around him snarled and howled, his worlds' strange atmosphere eeking angrily into theirs. He quickly closed the portal behind him as his long serpentine body slithered out, hovering huge in the skies above the forest. His crimson gaze fell upon the avian, who had been in wait below. His tongue summoned the common speech the world had adopted, long after it had forgotten his kind. Twenty-four hours straight of flying. 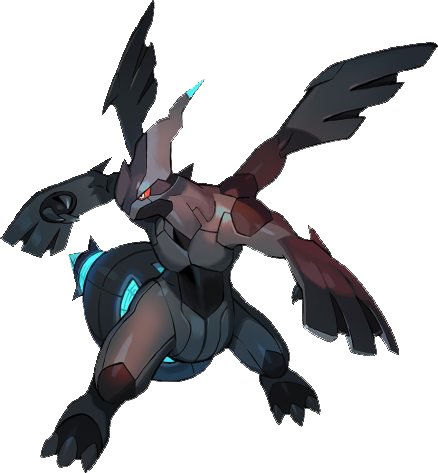 Needless to say, Zekrom's wings felt like they were going to drop off, and his sturdy shoulders felt like rocks. Still, the green shorelines of Johto had started peeking over the horizon and he put on a burst of speed towards it, eager to land and rest for a while. Blue-green waves churned on the ocean beneath him, as they had done for hundreds of miles, but he was finally here. If any of the regions had the answers he needed, it was this one. He spotted the distant treeline of a forest on the shores ahead of him, but just as he was making for it, a voice boomed from inside his head itself, shaking the walls of his skull. Zekrom slowed to a stop for a moment, wondering what had just happened. One of my breathren...? Having lived in Unova for the entirety of his long life, he had not met many other legends, and certainly not any outside of the region. Here, so far away from the land he knew and loved, it could have been any one of his more distant relatives. It was a thought that excited him, but also made his heart quiver with anxiety. He glanced up at the forest in the distance, wondering if that was the 'Ilex Forest' the voice had spoken of. He finally left the ocean behind, soaring over the cliffs and soon coming across the ruins of a small town. He considered briefly landing to rotate his poor shoulders and stretch his aching wings, but then the sky cracked open. Zekrom's eyes widened as a crackling portal appeared in the sky over the forest, humming and hissing with energies not of this world. A massive, serpentine creature slithered out of it, adorned with golden spikes and black, wisp-like wings. Giratina, his mind recited, instantly recognising the creature. There was no mistaking the ruler of the Distortion World. But what was he doing here, of all places? Had he sensed his approach, somehow, and come to greet him? Zekrom was hoping that said greeting wouldn't involve the otherworldly dragon attacking him, but Giratina's focus was on the forest floor below him. He...did not look pleased. Zekrom tilted his head curiously, wondering what he was looking at. He slowly drifted closer, cautiously, in case his predictions turned out to be true and he ended up having to defend himself. He would not have chosen to have to get to know his brethren in combat, but anyone who got in his way went down...legend or not. Lugia waits in the clearing for any of his brothers and sisters to come. Pondering what could have happened to the world, the answer wasn't just in plain sight; it was made by humans. Of all the things that could have been, this is what they came to see. Lugia heard some rustling in the bushes and was ready to wipe out anything that posed a threat to him. It stopped as whatever it was sounded like it fled. The avian whipped his head around seeing why though. A horrid odor had filled his nostrils and a single lightning flash revealed its owner. An Ursaring had stood there with bite marks and deep gashes all over it. Purple spots on its body had made it obvious and the eyes red void of any life had made its way to the spot. The legendary wasted no time in getting rid of it. A surge of psychic power rushes through Lugia and with a lift of his wing the undead gets launched into the air before being tossed away like it was nothing. "I am sorry, but I cannot let any undead filth taint this place." His words had some form of apology to it, but deep down he knows that his dark side would eventually break free. His mind however, had already in limbo from his experiences had put him into a deep trance. The avian now stood there staring blankly physically but mentally though he was staring right at his own shadow. It taunted him and beckoned in every way trying to awaken him to its power again. Eventually, Lugia snapped out of it and went into a panic trying to get away from its own fear. By then, he took some deep breaths then realized that there was nothing there. Looking up past the tree line however he seen two shapes. They was to big to be any avian and certainly shaped completely different from each other. "Who or what is that? Could it be my brothers?" Though taking the risk of approaching them would be bad if they was not of the living instead he waits on the ground till the approached. Everything around Lugia lifted into the air as he focused his power. Loose items that might have been held by humans started orbiting the avian as he concentrates on focusing, but his focus had failed and the items fell back to the ground. What am I and why does my own self want to obtain that power I detested after being freed from that torment? There was things that even Lugia wished never to remember. Things that he has done that caused others misery back in Orre. First things first is to address the issue they currently have at hand and the preventing of any other pokemon from being killed and becoming a walking corpse was the second issue. Hopefully by then they can come up with a plan, but that's if they can talk without needing to fight anything undead. The legendary's patience however did not last long as he stared right at the two above the forest. "What in Arceus' name are they doing up there? This is no time to mess around." Seriously though, why would the two if they're legendaries be hovering above? A look closer then revealed that they are legendaries. Lugia's eyes widened by the sight of the second dragon type. The ruler of the distortion world here of all places. "Giratina? I thought he was in the distortion world, but here he is of all places. Also is that Zekrom? Perhaps we stand a chance now." His message had gotten through which was good, but if Yveltal was awake then they have to take it somewhere where they'd be safe from his gaze. Below, the young avians' gaze was locked on him. His long scaled body slithered out of the raging portal, the snarling and hissing clouds dissipating as the tear healed itself. He descended out of the strange skies slowly, his crimson eyes glowing in the early hours of morning. You call out to the abyss, not knowing what lurks there, child. Do you realize the danger you put your lands in? Giratina let out a deep, growling hiss as he hovered over him, shaking his heavy head before scanning the nearby forest. The brush was uncommonly quiet from what he had remembered them to be. There was no teeming life here; not anymore. A wave of sadness rose up in him as he surveyed the expanse of treetops, reminded once again that the world was in its' death throes. His eyes caught movement over a ruined human settlement, where a large dark dragon approached with what seemed like caution. As it drew closer, Giratina rose higher and expanded his large wings, glaring down at it with suspicion. He recognized this ones' form; he was a lesser of the deities that populated this planet, just like the one who had summoned them. It was strange to see that another heeded Lugias' call. He was sure the avian was drowning in naivete to think that in this time and place, there was good will to be found. You're far from your dwelling. What is your intent? The hole in the sky knitted itself back together as the ghostly dragon seemed to spot him, rising up to tower over him menacingly. Zekrom maintained his perfectly calm composure; if Giratina was attempting to threaten him, he'd have to do a better job. Strangely, he did not get the impression that Giratina intended to harm him; more like assert his dominance. Zekrom stifled a chuckle. You may be one of the sons of Arceus Himself, he thought, but at the end of the day, you are as much a victim of this as any of us. Giratina's attitude made Zekrom want to tell him that it was none of his business, but the black dragon bit down on his tongue with a small shake of his head. If he was going to ally himself with these Pokemon, starting an argument would not be a good start. He got the impression that Giratina somehow knew who he was and where he was from. It did not surprise him, but it did make him feel strange that his endeavours throughout the centuries were enough for even a legend of another world to recognise them. He felt a swell of pride rise up within his chest. He drifted closer, slowly, as not to startle the volatile dragon into attacking. "I mean you no harm," he said, his rich, deep voice echoing between the trees. "Quite the opposite, in fact. I come from the distant lands of Unova to offer my aid, in any way I can." His tail whirred and flickered off small blue sparks as he rose to catch a glimpse of who Giratina had been talking to before he'd seen him. A large, white avian sat on the forest floor below, with a long, graceful neck and immense, feathered wings. Lugia, his mind recited. Guardian of the seas... what brings him so far from his home? He could ask questions later. For now, he would introduce himself. He held a clawed hand to his chest and dipped his head politely at the two fellow legends. "I am Zekrom," he said, "and it's a pleasure to meet you both." Lugia watched as the dragon type descend from the skies and looking rather pissed with the red eyes. Sadly, it wasn't the case that Giratina would have grounds to put Lugia in any way of risking their lives. The Avian had every intent to forewarn the other legendaries of Yveltal's betrayal and the rise of the undead. Also on the list was to see if they can find a place where other pokemon can be safe. However the decision would have to be unanimous between him and whoever else comes around. "The danger has already came before I awoke in the sea. Perhaps you've seen it on your way here." The still wind that was once full of life now empty feeling blew. The world they once knew was now a fleeting memory. Death, and the destruction of many areas had taken its place as life now hangs in the balance between the living and the undead. Giratina was looking away from him and staring at a human city. Lugia felt the presence of another Legendary. The dragon of ideals had heeded his call as well. "I am Zekrom," The black dragon says before continuing. "and it's a pleasure to meet you both." Since no others had heeded the call and waiting for anyone else would put them in mortal danger he'd have to go on with what had to be said. "Thank you both for coming on short notice. Giratina, Zekrom, I am Lugia, the guardian of the sea. We've got a situation that surely you both have came alerted to." Before Lugia continued to what had to be said, the avian looked around seeing if there was any signs of Yveltal. They couldn't trust the bird of destruction anymore and the threat he poses to them. Clearing his throat a bit, Lugia continued on with the situation. "The dead has risen and they're attacking the living with them having no place of safety to escape to. What more, those who are attacked by the undead don't stay dead for long." Taking a long hard look at their surroundings it was safe to say that this isn't a place where the other pokemon who are fighting to remain safe in. Everywhere around them was as of sadness and pain of those who died. This was their reality now and if fighting the undead for others to survive then they must have a plan. "Do we have a plan for those who would wish to be safe? I can't seem to get in contact with Suicune so I must ask one of you." "I am Zekrom," he said, "and it's a pleasure to meet you both." The dragon stared down at the ebony beast, puzzled. He tilted his head. Was he truly here to help? How strange. He had little faith in anything, and good will wasn't usually on the short list. He lowered his wings and body, assured that at the least, Zekrom would not attack. "Do we have a plan for those who would wish to be safe? I can't seem to get in contact with Suicune so I must ask one of you." Giratina let out a heavy sigh, escaping his nose as a low growling. The world had already abandoned all hope and lost itself somewhere along the way. With the creation of the virus, it just proved one final time that self-destruction was imminent. Your 'Suicune' is probably already dead. Humans have made sure of that, He hissed accusingly through a row of serrated teeth. Despite his irritation at Lugias' comment, the child had a solid request. His tired eyes gazed out over the dead expanses, unsure if there even was much left to save. But who was he to stop one of this worlds' inhabitants from having hope of survival? Certainly this planet belonged to them, and those that were innocent deserved a fighting chance. Very well, child. I will aid you in your cause. But know this. "Thank you both for coming on short notice. Giratina, Zekrom," Lugia said to them from his spot on the forest floor. Zekrom drifted down closer to the trees so he could hear him better. "I am Lugia, the guardian of the sea. We've got a situation that surely you both have came alerted to." He then stretched out his swan-like neck, taking an anxious look around. Zekrom's crimson eyes narrowed as he too surveyed the area. Is he worried that we're being watched? But by whom? He listened with a grim look on his face as Lugia relayed what they already knew: that the dead were rising and wreaking havoc wherever they went. "Do we have a plan for those who would wish to be safe? I can't seem to get in contact with Suicune so I must ask one of you." Zekrom perked a brow, intrigued. Did Lugia mean to try and safeguard them somehow? It was a noble endeavor, but one that Zekrom sadly doubted would be easy. The undead were already rampant in Unova; Arceus only knew how bad it was here of all places, if he was right in discovering it had all started in Johto. He rumbled out a growl, thinking to himself, when Giratina spoke with a snarl. Your 'Suicune' is probably already dead. Humans have made sure of that. The name rang a bell in Zekrom's head and he was sure that Suicune was the name of a fellow legend, but he couldn't pinpoint any specifics about him or his history. Giratina's mention of the humans, however, sent a shiver of fear down the black dragon's spine. Very well, child, Giratina then said. I will aid you in your cause. But know this. The humans...are mine. The ghostly dragon's blatant malice towards the humans made Zekrom's stomach twist with anxiety. Did he know something that he and Lugia didn't? The humans made a lot of mistakes, but surely... surely they wouldn't do this...? Questions raced through his mind, but now was not the time to ask them. The three of them had been out in the open for too long, and it was only a matter of time until trouble found them. Zekrom looked down at Lugia, giving the avian a firm nod. "I will help too," he said. "However I can. I did not travel all this way to be a mere spectator. What is the plan?"